How on earth are we already in April? Surprising as it is, I'm loving it. We're having warmer weather (in the 30s--nice and balmy!) and we're hurtling towards the end of the school year. I'm getting excited for summer (is it too early to be excited for summer?) and I'm really excited to celebrate Easter and General Conference this weekend. April also means a new Visiting Teaching message. I am loving these attributes of Christ that we are studying this year, and I have to admit, each month they kind of surprise me. They are not the attributes that I assumed we would be learning about. April's message is The Attributes of Jesus Christ: Without Guile or Hypocrisy. "Without guile" is one of those things we read about in the scriptures or hear in a talk, but sometimes don't completely understand. I've always understood that it means someone who is honest and has integrity, but I love the nuances pointed out in the lesson. To be without guile is to be innocent and have pure motives. And, according to Joseph B. Wirthlin, it is an attribute that is absolutely necessary in our day--a day when most of the world doesn't see the importance of or understand this virtue. Hypocrisy is a word there isn't much question on. I have to admit that I can be hypocritical. Sometimes I say one thing and do quite the opposite. 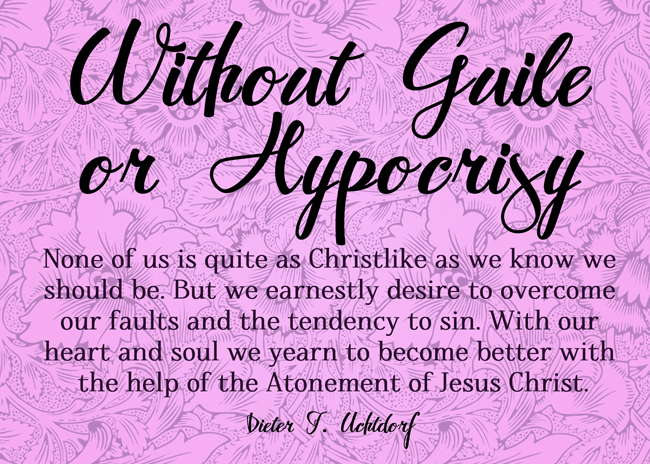 That is why I love President Uchtdorf's quote so much and why I used it on this month's printable. Because I DO want to be more like Christ, even though I am aware of how many faults I have. I don't mean to be hypocritical, but sometimes it happens that way. But through the Atonement, I can overcome my faults and do better. Love, love, love that message--especially now as we celebrate Easter week. April 2015 Visiting Teaching Printable. I hope you all have a wonderful Easter and General Conference weekend! And happy April visiting teaching.